MIPJunior’s first day ended yesterday with a showcase of the most creative new properties from around the world, spread over two awards ceremonies: the MIPJunior Licensing Challenge and the Kids’ Jury Ceremony Awards. The latter saw three juries of children rating a selection of programmes aimed at their age groups. Chinese company Fantawild Animation (pictured above) won the Kids category (7-10 year-olds) with Hick-City. Daisy Shang collected the award. French TV presenter and producer Billy (left) led the judging sessions. 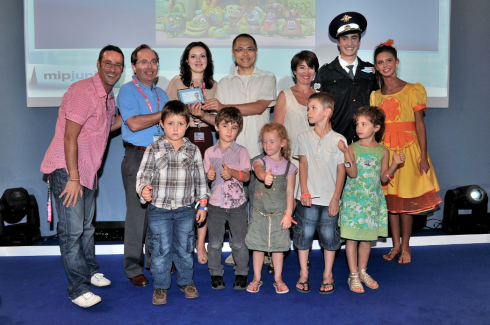 The Pre-School category (3-6 year-olds) was won by French firm Cyber Group Studios with Patch Pillows. Steven Ching (right) and Pierre Sissman (left) collected the award from Channel One‘s Tatyana Lobanova. Australian company 1440 Productions scooped the prize in the Tweens category (11-14) with Dig Deep Creek. Kristy Fuller collected the award. The jury members were drawn from the International School in Nice, while the awards were sponsored by Carousel. Earlier, the eighth MIPJunior Licensing Challenge saw German company m4e/Telescreen take the prize with Mia and Me, in the face of strong competition from Guru Animation Studio, Luke Nola & Friends, Millimages, VOOZ Co and PGS Entertainment. 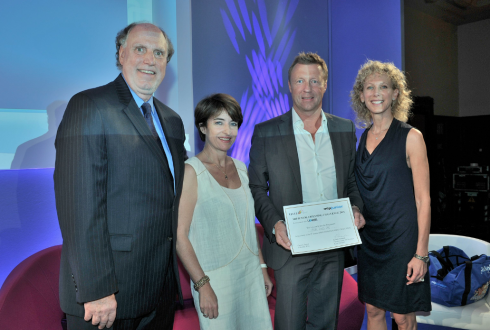 m4e CEO Hans Ulrich Stoef collected the award, and is pictured above with (left to right) License! Global magazine’s editor-in-chief Tony Lisanti, MIPCOM director Laurine Garaude and president of the jury Holly Stein, from Mattel. The winner was chosen by a jury of industry experts including Stein, Maria Kristina Doolan (Zinkia Entertainment), Elias Hofman (Exim Licensing), Grahama Grassby (Stella Projects) and Bettina Koeckler (Chorion). The Korea Creative Content Agency (KOCCA) sponsored the Challenge.